Is your commercial flat roof leaking or showing other signs of damage? You should not hesitate to call in a licensed, knowledgeable roofing contractor to pinpoint the problems and correct them. Your commercial roof is too vital a building component and too big an investment to ignore, and delaying roof inspections, maintenance and repairs—particularly when you’re seeing signs of damage—is a recipe for disaster. Many building owners delay seeking the services of a professional roofing contractor because they’re afraid of hearing the R-word: replacement. A roof replacement is, indeed, a very expensive, time-consuming and labor-intensive process. 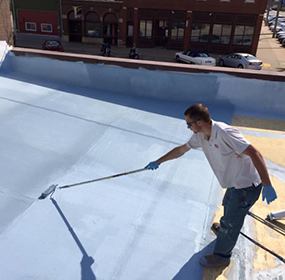 But did you know that flat roof coatings can resolve all of your roof’s problems and extend the life of your existing roof—all at a fraction of the cost of roof replacement and without the expense and heavy labor requirements of a roof tear-off? 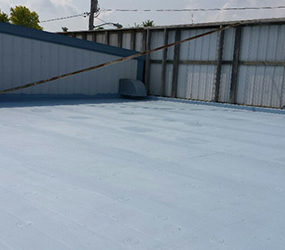 Call E&E Construction Company today at (740) 331-0695 to find out if a flat roof coating is a viable option for your commercial roof! As previously discussed, replacing a commercial roof is a huge expense, and the process can be extremely disruptive to your business operations. So, if a less expensive and highly effective alternative is available, why wouldn’t you opt for that instead of a costly roof replacement? 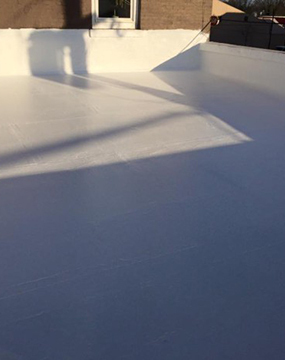 A flat roof coating is the equivalent of having a new roof installed, but without the inherent drawbacks, like the massive expense and extensive labor requirements. Give E&E Construction a call today at (740) 331-0695 to find out if your commercial roof is a good candidate for a life-extending, problem-solving roof coating system. We will send one of our expert technicians to your location to thoroughly examine your roof, pinpoint any problems, and consult with you about roof coatings and other available options to address any roof issues. For all of your roofing needs, you can count on the expert team at E&E Construction. Our technicians are professionally trained to do each job right and to apply the very best products and solutions to resolve any roofing issues. Give us a call today and experience the E&E difference for yourself!